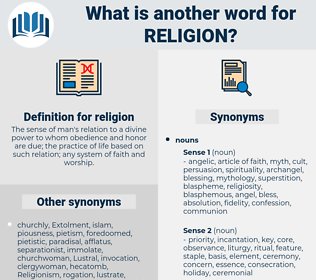 What is another word for religion? The sense of man's relation to a divine power to whom obedience and honor are due; the practice of life based on such relation; any system of faith and worship. denomination, religiosity, clergyman, Clergymen, interreligious, region, Religieux, doctrine, dogma, affiliation. creed, confession, worship, faith, religious. truth, agnosticism, fact, neglect, carelessness, atheism, disbelief, reality. wickedness, irreligion, blasphemy, profanity, sacrilege, godlessness, Know-nothingism, impiety, ungodliness, lapse, secularism. Then why did Miss Glyde call it a religion? Now you are going to come religion over me. religiousism, realign, Ruholla Khomeini, Royalism, relaxin, realism, royal casino, Ruralism.